Dusty exteriors can make your building look old and unappealing. With Impact Hygiene’s Pure Shine service, you’ll have your outdoor surfaces looking sparkling clean again. Using the latest hi-tech cleaning equipment and doing it in a minimal amount of time, we give you satisfying results at a competitive rate. 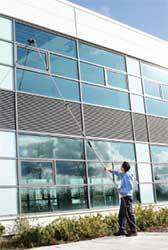 Dust and pollution have the tendency to stick to residual chemicals left on buildings and external surfaces after they’re cleaned. Pure Shine boasts of a chemical free technology that leaves the surface shiny, clean and free of any substance. Not only is our chemical-free clean gentle on the environment, it also saves you money because you’ll need us less!